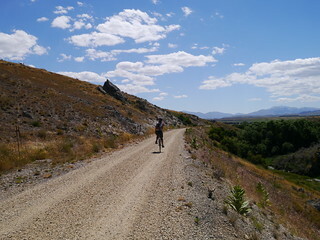 The trail continued a further along the river and we stopped at Millers Flat for an ice-cream stop. From there we carried on to our lunch meeting point in the town of Beaumont. 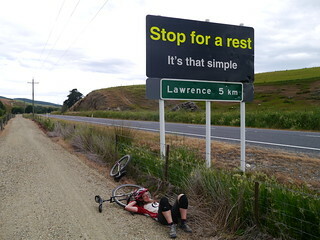 Several riders missed this, as the town consisted of a single pub! From there the trail continued through farmland and landscape which still bore reminders of the area’s gold rush history along the way. Our accommodation at the Lawrence Townshouses had massage chairs and a hot tub for us to relax after the day’s riding. The perfect way to end the day! We had a nice continental breakfast and then posed for a group photo with for our hosts Bruce and Esme in front of Lauder School. 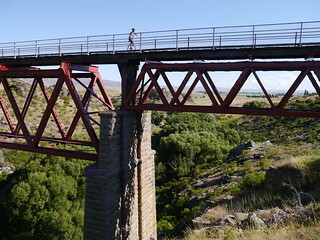 The trail would take us to Alexandra today, where we would finish the Otago Rail Trail and start the Roxburgh Gorge Trail. 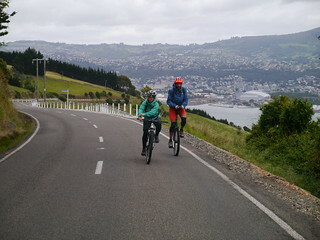 The local press had gotten wind of our trip, so we met an Otago Daily Times reporter under the Alexandra bridge as we rode past. 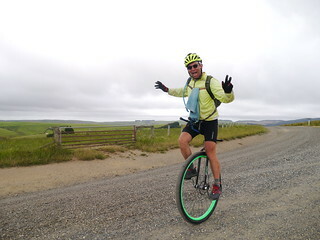 He spent some time interviewing the unicyclists as we were having lunch. This was also the start of the Roxburgh Gorge Trail, which follows the Roxburgh River as it carves its way through the Roxburgh Gorge. 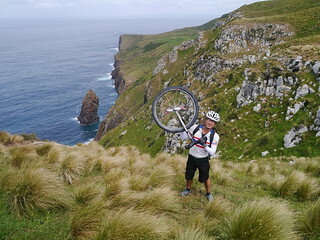 It was both scenic and fun to ride, with rolling singletrack all the way to Doctors Point. 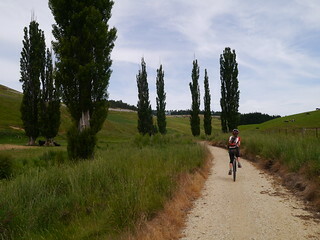 The Roxburgh Trail is in two sections. 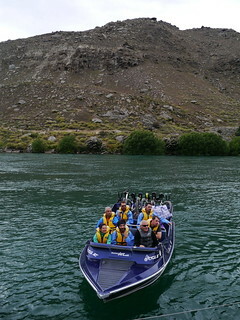 We had to meet a jet-boat at Doctors point for a boat transfer further down the river, where it connects up with the second part of the Roxburgh Gorge Trail. 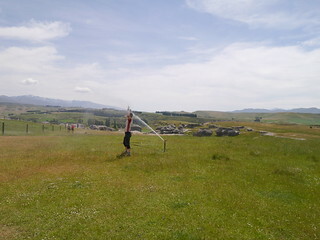 The Roxburgh River is lined by stone cottages/sleepouts used by the prospectors during the Otago Goldrush, and the jet-boat driver gave us a commentary of the hardships they endured. 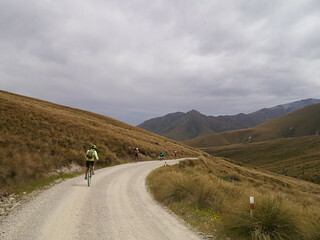 We were dropped off at Shingle Creek, where it re-joins the Roxburgh Gorge Trail. 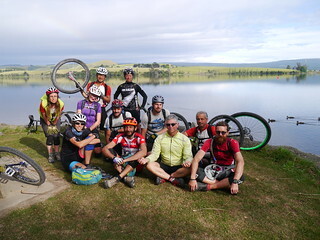 The last section of the trail had some grunty climbs, and took us to the finish at Roxburgh Dam. 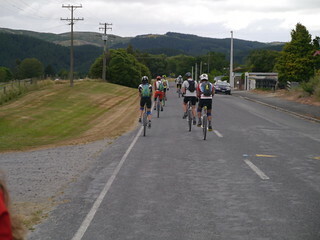 We met up with our support Vans and then took a short gravel descent to the start of the Clutha Gold trail. This followed the amazingly turquoise coloured Clutha River, and the tree lined trail took us to the Roxburgh Motel, where we would spend the night. 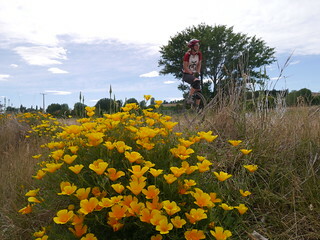 We were to begin the Central Otago Rail Trail in Hyde, not quite the start in Middlemarch but enough for us to see a good portion of the trail. After slopping on thick layers of sunscreen, we set off on the Rail Trail. 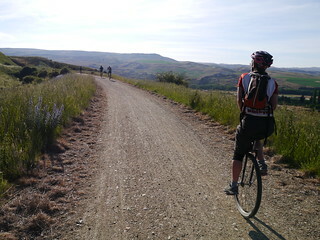 The trail was smooth and climbed very gradually. We went through several long railway tunnels which was a lot of fun- the more organised riders brought lights, the rest of us just aimed blindly toward the light at the end of the tunnel, hoping we wouldn’t hit an obstacle or crash into the tunnel walls along the way. It was a hot day, and getting hotter by through the afternoon. 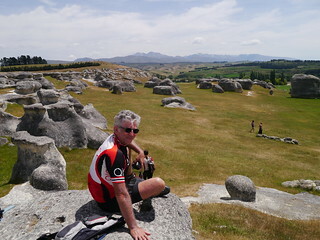 We stopped at various points on the first SINZ tour, with Ken recreating photos he took 10 years ago. 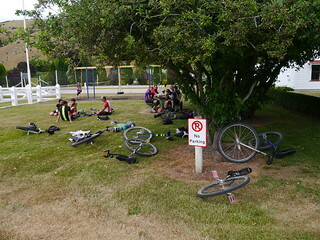 Of course, there was an obligatory refreshment stop with much time spent outside Ranfurly station sipping cold drinks and licking popsicles. 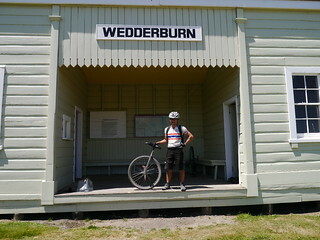 The support vehicles met us at Wedderburn station, where the original building is featured in a famous painting by Otago artist Graham Sydney. 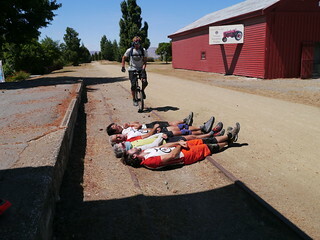 It was a good place for an afternoon siesta, with many of the riders snoring away in the shade. After lunch we were back along the rail trail. It was an incredibly hot, long stretch of trail, punctuated by impressive looking bridges. 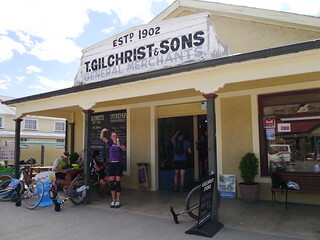 We had another ice-cream stop at the Gilchrist Store in Oturehua (the oldest continuously trading store in New Zealand), before riding a bit further to arrive in Lauder. We stayed at the Lauder School B&B, a converted school accommodation run by Bruce and Esme Dawson. The rooms are aptly named, with riders staying in the ‘detention shed’, ‘music cottage’, ‘art room’, staffroom’ and ‘sports shed’. 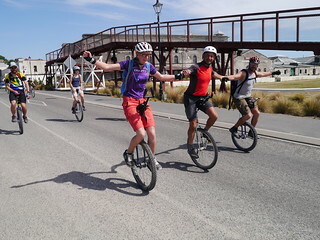 We had a hearty meal across the road at the Lauder Hotel, instantly doubling the population of the town with our unicyclists. We had another day to rest the legs and catch up on washing, eating and sightseeing. 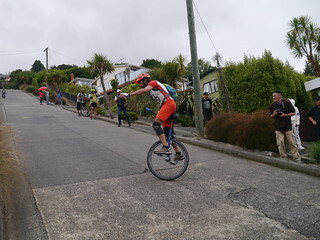 The original intention was to spend the day mountain unicycling in Naseby’s renowned mountainbike trails, but most riders elected to rest the legs instead. 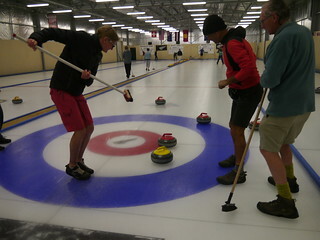 The Curling Rink was just down the road, so we headed there for a session, which was really fun! Many of us had watched curling on TV, but never tried the real thing. We hefted the heavy granite slabs across the ice, trying to get them into the target zone, helped along with some strategic brushing of the ice. 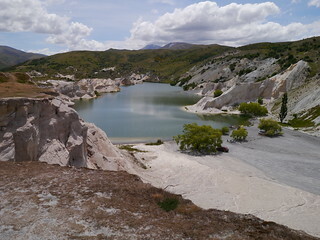 In the afternoon we headed to St Bathans to soak in the blue lake and have lunch at the pub. 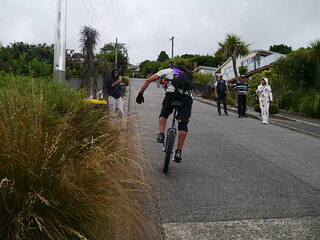 This was a day that some riders looked forward to, and others dreaded. 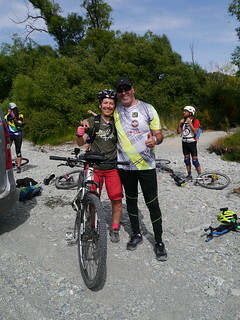 It was going to be a big climb up Danseys Pass, then a big descent to Naseby, where we would connect up with the Central Otago Rail Trail. As we expected it was up and up and up!!! 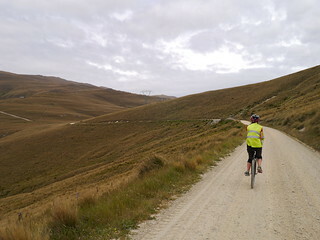 This is a quiet unsealed gravel road, with farmland gradually making way to more alpine tussock as we climbed. For Anna and myself, it was the most fun ride so far. 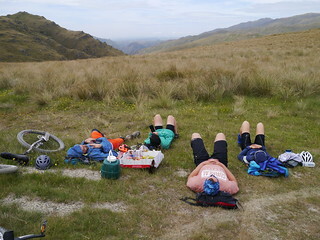 When we reached the top, we could see had a picnic lunch amongst the tussock, with not a bad view! 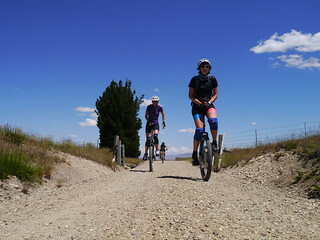 The trail then descended, with another short climb before dropping down to Naseby. 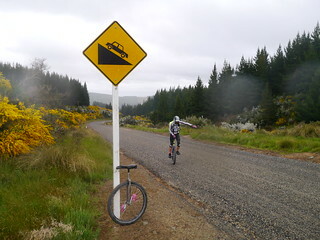 The total climb for the day was ~1300m, so the legs had good workout. 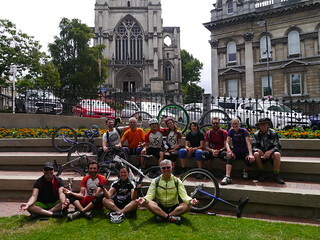 We still had to finish the A2O trail, so after breakfast the riders gathered to ride the last 2km to the finish, across the botanic gardens, through the beautiful Oamaru Stone buildings and to the pier at the finish of the A20 at the Pacific Ocean! 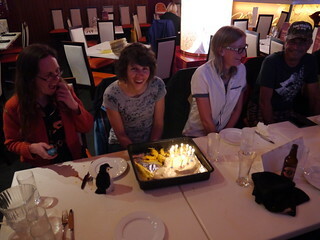 It was a great way to finish the first part of our trip. 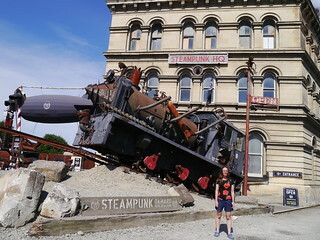 We spent the day catching up on washing, exploring the town, and going to the Steampunk museum. 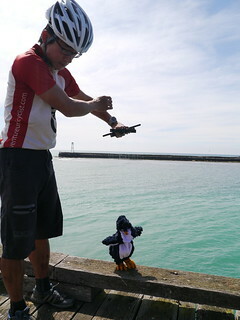 One of the best things about Oamaru is their little blue penguin colony. In the evening we went to watch the cute penguins come back to shore and scurry into their burrows after a day out fishing. 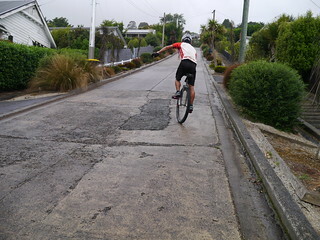 Todays ride would be one of the toughest. It was a scorching hot day. 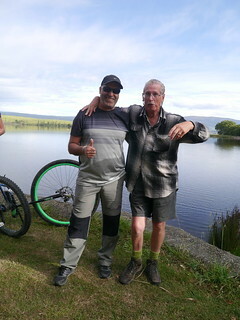 We rode the gravel track, crossing several dried up rivers and then had a stop at the Maori Rock Art site for a walk. From there we continued through Duntroon, and then climbed up a steep hill to the Elephant Rocks, which were impressive rock formations of the side of the trail. 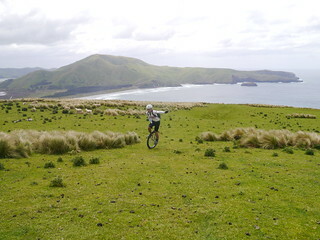 The trail continued on to further interesting limestone escarpments along Island Cliff, then degenerated into soft white limestone gravel, which was horrific to ride on. 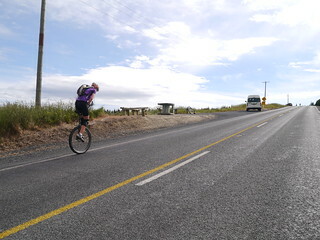 Until then, the Alps 2 Ocean trail had been perfect for unicycling, but this stuff was like riding on lumpy flour. 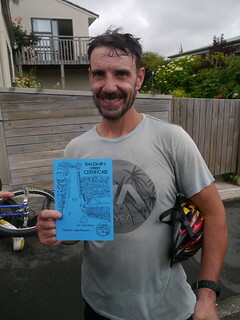 It was a painful grind the last 40km to the finish in Oamaru. 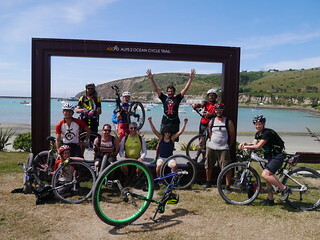 We were completely shattered by the time we reached our accommodation, so we decided not to finish the Alps 2 Ocean trail today (which ends at the pier on Oamaru beach), leaving it for the next day. We had a BBQ dinner which Gaetano took charge of, and it was quite a feast for the ravenous riders.